I believe in game film. I believe that before you face an opponent, you need to know what his tendencies are on offense and defense. Do they run a spread or pro-style offense? Can their weak side linebacker cover a tight end? Is their coach a risk-taker or a meticulous manager? I believe that before you go into battle you need to have done reconnaissance. What are the natural boundaries of the battlefield? What are the resources available? Who trained their men? I believe that before you preach the Gospel, you need to know the idols the people worship. What is it that they love? Where do they go for comfort? Who are the most influential voices in the culture? How is Jesus the only one who can fill what they are looking for? And I believe that in any of those scenarios, you first need to know who you are. Where do you find your identity? How are you uniquely gifted for the task and what are your blind spots? Who are your biggest influences and how have they effected you positively and negatively? Biblically, we see Paul doing this in Athens in Acts 17 (v 16, 22) as he addresses the leaders of Athens by using their polytheism as a starting point to preach Jesus, the only one worthy of worship. We see it in the various letters of the New Testament, each written to a particular group of people, addressing particular concerns. In the helpful and comprehensive book The Mission of God, Christopher Wright’s shows us that mission originates in the nature of God, He is a missionary God. So, before the Apostle Paul, Martin Luther, or David Livingstone, the famous missionary to Africa, were participants on God’s mission, they were recipients of it. God's mission to bring reconciliation between him and man (2 Cor 5) and to restore all in creation that sin has marred (Rev 21) is one that God initiates, that God brings us in to, and that He allows us to participate in. 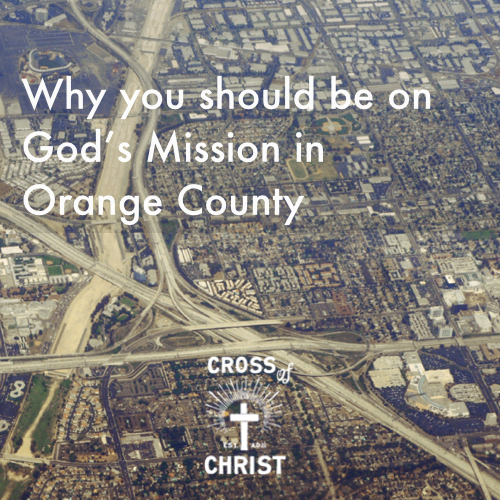 Seeing that mission originates from God himself counters two errors Christians can fall in to. Both errors stem from seeing mission as optional, as a subset of a believer’s life or a program of a church. On one hand, some Christians can fall in to the error of apathy. Because mission is optional in life or a program for the ‘varsity’ Christians, some believers may think they can ‘opt out’. On the other hand, some Christians can fall in to the error of arrogance - that because they are the ones on the short-term mission trips, planting a church, or even doing long-term missions work that somehow mission is encapsulated in their particular cause. How did you come to faith in Jesus? Seeing that every believer is a recipient of God’s mission before they are a participant gives us the only sustainable motivation for a life on mission. Because God has sustained his mission from the Garden to the cross and through the centuries, and because he used a myriad of people to bring you to faith - friends or parents who prayed, a small group who patiently pursued you, co-workers and friends who talked to you about Jesus - you can’t be apathetic or arrogant! You can only be humbly and gratefully urgent. When I was young I thought I knew everything. I distinctly remember, in my mid-20’s (pray it doesn’t take you that long), having the terrifying realization that so much of what my parents said was right. It was like that moment in the Sixth Sense when you realize that Bruce Willis was a ghost - it changed my entire interpretation of history. They weren’t domestic dictators, they were loving enough to tell me ‘no’. They weren’t Puritanical when they told me that I didn’t need to be out late because ‘nothing good happens after midnight’; they were largely right. With long-suffering and tears they patiently disciplined me, prayed for me, and nurtured me at my worst until one day it ‘clicked’ in me and they finally got a ‘thank you’. How can I not be thankful for that? How can I not want to tenaciously carry on that legacy to my kids? How could I arrogantly take credit for who I am when so much of it has been received? I am a recipient of grace who, at my best, wants to humbly, gratefully, and urgently pass it on. So it is with receiving and participating in grace on God’s mission. Over the coming weeks we will be looking at what has informed the planting of Cross of Christ Church in Orange County - a summary of the history of the region, the cultural forces that resulted, how they manifest themselves in the region and more largely in our generation. My heart is for the message of Jesus we boldly, lovingly, passionately, gracefully declare in the hopes that tens of thousands will be reconciled to the Father by faith in Jesus, dozens of churches that work towards renewal, reconciliation, and restoration will be planted in the name of Jesus, and the legacy of an entire region altered.